To love yourself within is to open a magical door to happiness. This piece explores, the realms of the inner child and how loving and exploring it can make our relationships beautiful. I open the creaky door, to find a little kid lost and scared. She gathers faith and slowly steps out to the brightness of the day. The first ray of light makes her eyes squint from the glare. Gradually I see her eyes twinkle and she is now ready to play. The little kid closed in the dark, dingy room is our inner child – the child who has been closed for years after we snatched the crayons from her, told her it was simply waste of time and introduced her to hell a lot of tables – the time tables, the trigonometry table, the algorithm table, the periodic table, and made sure she takes life as a series of rows and columns. The inner child hid under all these tables and never asked for her crayons back. She thought it was wrong to do so, or how everyone said it was being “immature”. The society somehow finds it necessary to mute this ‘inner child’ to create successful ‘walking zombies’ for the cultured world – the ones who can say what they don’t feel, and feel what they would never ever say, who can instantly put on those plastic smiles and churn out jargon that hardly mean anything to them. Whenever someone compliments a little kid and boasts of her/him being ‘so matured’, my inner child whispers to me in despair – “another inner child successfully muted, not fair.” In the Victorian Era it was believed that children should be seen, not heard.The mantra of growing up for the inner child in us seems harsher – “your inner child should be neither seen nor heard”. That’s supposedly the way to successfully climb the social ladder or even find a life partner. Life becomes a race towards perfection – as perfect as the tables we were introduced to and if it doesn’t look perfect – don’t panic you got an app for that too. Oh! go ahead and add those awesome filters. Does the race in adult life actually fill the void, or does the thrill of the pace just makes us numb letting us temporarily avoid the void? 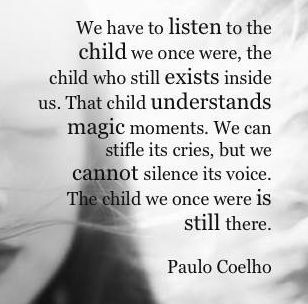 The world today is as enchanting as it used to be when we were kids – the problem is that we get farther and farther away from our “inner child” in the process of growing up, gradually losing the truest essence that brings us pure joy. Everything comes in full circle, so the structured corporate adult world now wants the employees to bring in their ‘inner child’ to the office because they have realized that it is the inner child that possess the purity and energy that unlocks the creative process. Unlike the industrial mass producing era, organizations now need creativity and innovation more than anything else to survive. Happier are those who find someone who lets their inner child out to play. Imagine the joy of jumping in the puddle as a child – the joy is doubled if you have a mate who jumps along with you, splashing mud all around. You might call this crazy or impractical. Here is an example of a couple who run a tea shop in Kochi, come from a normal back ground, saves Rs 300/- each day in a piggy bank for making their “inner child” happy – they have traveled 17 countries so far and still counting. 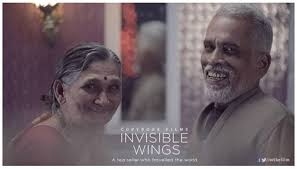 More than being an inspiration to travel, I think here is a couple who let their inner child fly with her “invisible wings”. Check their inspiring story. Nurture your “quirky love” because when life gets way too serious (and for sure it does), you always need that “someone” your inner child can come out and play with. Doubtful? Wait till you watch the video from SoulCafe below and get to meet some real quirky couples! STAY QUIRKY! STAY WEIRD! LOVE THY INNER CHILD!